Menlo Park resident Mary Closs first picked up a tennis racket when she was around six, hitting the ball around with her mom, who’d grown up playing the game. But like lots of kids her age, tennis wasn’t the only sport she played. In sixth grade she decided to focus solely on tennis. Now at 15, Mary, who will begin her junior year at St. Francis High school this fall, is finding success on the USTA tournament circuit. Currently she is ranked #2 in Northern California in the Girls 16 Singles and Doubles. She is ranked #46 nationally in the Girls 16s. At the recent NorCal sectional, Mary won girls doubles with partner Emma Marti, lost in the singles finals, and walked away from the tournament with the Sportsmanship Award. “I was playing 18s, so I feel accomplished that I got to the finals,” she says. She’s spending the summer playing in tournaments, including two national championships — one on clay and the other hard court. 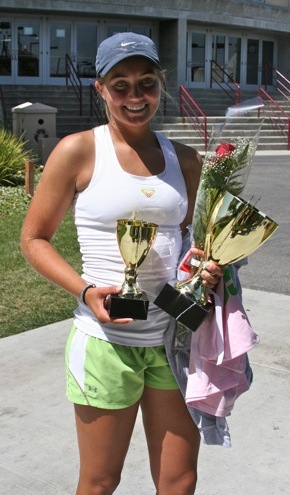 At the USTA National Open in Lakewood earlier this month, she reached the finals in the Girls 16 Singles; she and her partner Hadley Berg won the tournament Girls 16s doubles. She traveled to Shreveport, LA, for the USTA Intersectional Team Championships, which is played on clay. Four girls and four boys were selected to represent Northern California. Next post: Spotted: Bell Brothers get audience participation!